I don’t often post about work. If at all. Well, I’m a longtime fan of Christina Aguilera, appallingly documented by a search of this here blog. So here’s a post with a radio station from where I work (Slacker Radio). Enjoy! Fifteen years ago this week, Christina Aguilera’s “What a Girl Wants” became the first number one song of the 2000s. Since then, Aguilera’s career has grown exponentially, from winning four Grammys to a starring role in “Burlesque” to her work on “The Voice.” In tribute to her amazing career, we’ve created a station that features your favorite Christina Aguilera songs. We used our E.Q. system or “engagement quotient” to add up your plays, skips, hearts and bans, and came up with this definitive list. 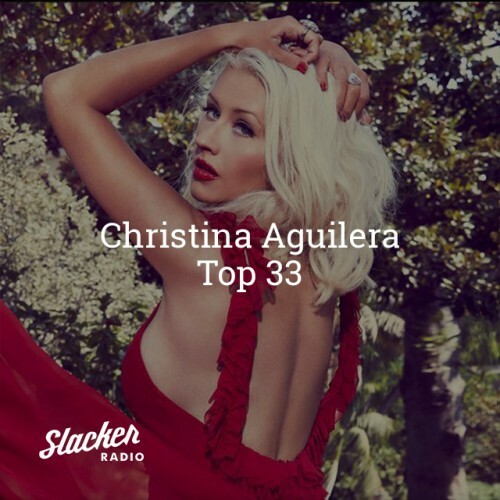 # 2015 January Zero comments Christina Aguilera slacker radio . In part it is irrational because her roots are multiethnic, like me. I have at least Scot, Irish, Mexican, Spanish, French, and Yaqui in me. Christina can legitimately claim to be Latina, and be on the cover of Latina Magazine. She can also claim Irish heritage, and appear in the Irish Abroad web magazine. This is a wonderful example of the melting pot. Many of us in the USA are just mutts. Interesting things happen when cultures mix. It also illustrates the fluidity of racial definitions. In the end we all should be judged by the content of our character. # 2001 May Zero comments Christina Aguilera United States web magazine . DeeIsChristina.com (link from Erin). The new record by Christina Aguilera should be good. I’m going to pick it up when cashflow is a bit better. So far I’m actually impressed. Check out christinaaguilera.to for current Xtina (yeah, that’s apparently her nickname) news. And yes, I think her fashion choices stink lately. # 2002 October Zero comments No hashtags. Longtime readers know that I’m a Christina Aguilera fan, and follow what’s up with this young popstar. This recent interview with Allure Magazine is a nice update. Nice to see her realizing that she got overexposed, and overworked last year. I remember for a while that any time she’d appear on TV she looked so tired. I would note this to Jenny; now, Jenny’s not particularly interested, but she generally agreed. My hope is that Christina will get a rational schedule for the promotion of her new record. The new record, which I’m looking forward to. The inclusion of an Etta James cover can’t help but be a good sign. Hey, Xtina can sing, aiight? # 2002 April Zero comments Christina Aguilera Etta James . # 2002 February One comment Christina Aguilera . # 2008 July One comment misc movies politics programming webdev . I mentioned yesterday in a comment in response to a comment my old friend Erin made, wherein she mentions she heard Christina Aguilera and thought of me. Yes, I was so into Christina several years ago that a certain number of people now associate me with her. I’m not listening to that much Christina Aguilera these days. In my reply I mentioned a band called “Tree Wave,” whose website is located at http://www.treewave.com/ . They stimulate my brain cells and heart in a way that is rather hard to describe. I first heard them in the BBS Documentary, where their music is part of the opening credits of some of the pieces. You can read about all the music on that excellent documentary on the BBS Documentary Production: The Music page. You can also download the “Cigarettes and Coffee Introduction” and “Morning Coffee Hymm” on that site. I am filled with nostalgia and wonder. I’ve had it on while working for maybe 20 minutes and I love it. Highest possible recommendation. I wrote that after having watched 20 minutes of the thing. 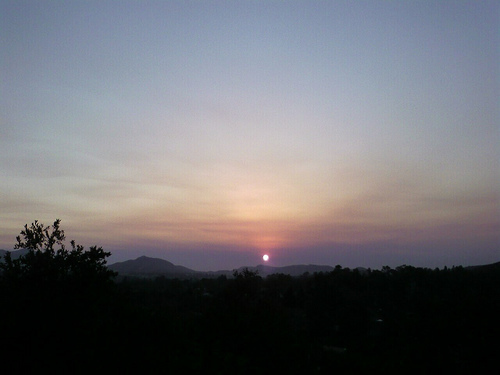 And it only got better. Part of that was the pitch-perfect music that matched the tone and content of the documentaries perfectly. Tree Wave (or is it Treewave?) makes music using antiquated electronic computers. Now, I didn’t know this at the time, and I had no idea there was more than just a few soundtrack pieces from this band. 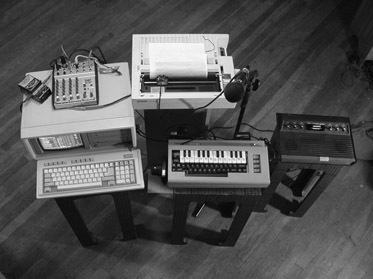 Paul Slocum took an old Epson LQ500 dot-matrix printer and reversed engineered a box that lets him program and play music through it by changing the speeds and strengths that the pins strike the paper. It really has to be heard to be believed (it’s part of the song – former dot-matrix users will hear it right away). He also uses an Atari 2600 with a modified cartridge to generate drums and “bleep” sounds. Pretty impressive stuff. We’re a Dallas based band that makes shoegazy pop music and video using obsolete 70’d and 80’s computer and videogame gear, accompanied by female vocals The code to drive the music and video is our own, and it’s all dirty assembly language. Music comes from Commodore 64s, an old PC FM sound card (OPL3), and a dot matrix printer, and video is all Atari 2600. We perform regularly at festivals and new media venues in New York and Europe, and our cd that we released last year has received a flood of positive reviews Our videos have been screened at galleries and festivals in New York, Canada, and Europe. It was really a funny moment as I was driving along listening to the panel, because suddenly I was hearing the theme to BBS Documentary and for a split-second thought this guy might be ripping it off! Then I realized this guy was a “good guy” and that he was calling his band “Tree Wave” and I had to seek it out. I still have not bought their CD officially, just listening to publicly available mp3 files, but it’ll be my next music purchase. If you download the SXSW podcast Paul Slocum and his descriptions of reprogramming the firmware by plugging into the font expansion port of a dot matrix printer, and his other descriptions of messing with 1980s hardware starts at about 11:05. Again, for a certain subset of folks out there, I give the highest possible recommendation. Also during the SXSW presentation he plays a song using the game Combat and in playing the song it’s laying information over the top of the game’s data area, deconstructing the game. This is wonderful stuff, I wish this YouTube video were better, I think the compression of the Flash video can’t keep up with the 8-bit graphics. # 2007 September Zero comments electronic music tree wave . # 2007 August One comment No hashtags. *Me: (reading net news)* Christina Aguilera’s getting married this weekend. *Leah:* Oh, it’s too late for you. *Me:* That’s pretty funny Leah. # 2005 November One comment No hashtags. # 2005 October One comment itunes music . Green Grow The Rushes — R.E.M. # 2004 September Zero comments No hashtags. I like that list because it shows the depth and breadth (or lack thereof) of my music. # 2004 July One comment No hashtags.